Toronto, Ontario, December 4, 2018 - “MarketWatch”, the Toronto Real Estate Board’s monthly residential market statistics report, was released this morning showing that while November, 2018’s average selling prices virtually all had a “+” in front of them - the lone holdout being Townhomes in Metro Toronto - the number of homes sold…ummmm….didn’t. Ditto for the inventory-related numbers. 6,251 home sales were reported through the TREB MLS® system by Toronto & GTA Realtors® on the month, off 14.7% from last November. The overall average selling price was $788,345, up 3.5%. That price gain, though, was largely on the back of the Condo Apartment group. All figures quoted herein are year-over-year comparisons unless otherwise noted. These reports are very broad and general by their nature. If you’re looking for an update of your own Town or Neighbourhood, use this SmartSearch which includes Active and Sold information for any TREB area. The City of Toronto - “The 416” - saw 705 Detached homes sell, down 12.5%, at an average of $1,301,382, up 1.8%. 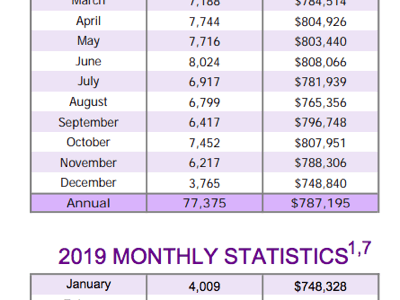 In the rest of the Greater Toronto Area - “The 905" - 1,960 Detacheds went under contract in November, down 14.8%, at an average of $903,517, nearly flat at +0.8%. Condo Apartment sales also softened significantly and it appears that that’s not merely a function of supply constraint in the case of Toronto: Sales in the balance of the GTA were down about the same percentage as T.O. itself. 1,370 units sold in the City of Toronto, down 14.2%, at an average selling price of $595,678, up 7%. In the rest of the GTA, 521 sold, down 13.5%, averaging $454,288, up 9.5%. Total Active Listings [TAL] - representing overall market supply - fell a significant 9.8%…even in the face of those lower sales numbers…to 16,420. It may be that in the face of lower sales and lower prices [versus the infamous Spring of ’17], Sellers are opting to sit tight in hopes of a more robust Spring of ’19. More robust than now, that is. We see nothing on the horizon - obviously - that would drive anything like what happened two springs ago. Quite the contrary, in fact. There are several headwinds, not the least of which is upward-trending interest rates. 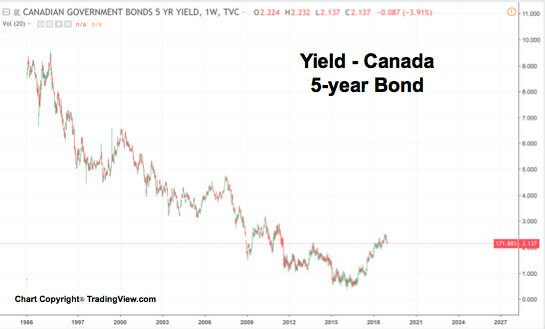 Never mind the rhetoric out of government offices: Bond markets ultimately control interest rates and, despite a reprieve of late with the 5-year yield backing off it’s early-October “top” just below 2.5% to closer to 2% at the time of writing - rates have been trending higher for nearly three years. And, while rates are still low by historical standards, GTA home prices are not. Forward Inventory, which is Total Active Listings divided by Sales, stood at a relatively healthy 2.63 months. While that will begin to rise sometime early in the new year, it’s probably a good bet that “balloon” will be substituted for “rise” as Sellers don’t appear to be willing to adjust ask prices to reflect market conditions and many buyers struggle with affordability. A year ago the FI figure stood at 2.47 months after active listings spiked an incredible [and welcome] 110% in the wake of that Spring’s buying frenzy. The Absorption Rate - the rate at which the market “absorbs” newly listed homes as sales [also referred to as the “Sales to New Listings Ratio”] -was a robust-sounding .593. That compares to .514 a year ago…and .813 two Novembers ago in the hot sales/tight inventory prelude to “that Spring”. It should also be noted that New Listings tanked 26.1% in November. While the TAL figure tends to be a more reliable indicator of market inventory since it’s “pure” - as opposed to the New Listings figure which fluctuates to a significant degree based on listings being terminated & re-written - 26%’s a lot. Late in the year + sellers & agents coming to the conclusion that so much re-writing of listings is no longer productive is likely making a healthy contribution to that drop. Homes took “12.5% longer” to sell in November at 27 days on the market [DOM] compared to 24 days a year earlier. Thanks for stopping by… Have a wonderful and safe December and Holiday Season. Set Up Your Own Customized "SmartSearch"